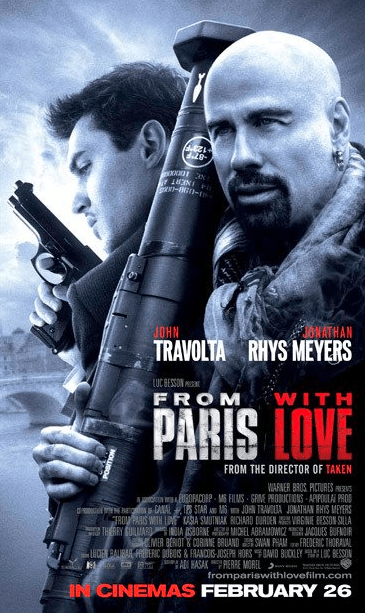 From Paris with Love is a 2010 action/chrime/thriller movie with an iMDb rating of 6.4 out of 10, not really impressive rating. After watching the movie, I wouldn’t call it “cinema worthy”, but it’s not a bad way of spending the 92 minutes watching it as a rental movie. Yes, it’s only 92 minutes. On iTunes Store, where I rented it with my Apple TV, it had a much better rating than on iMDb which is why I rented it in the first place. I don’t regret it though, as having said, it’s okay for a movie rental to spend 1.5 hours on it. The movie itself is really simple with the “usual plot” from many action movies. There’s the good guys (John Travolta and Jonathan Rhys Meyers) that will have to protect a delegation against the bad guys. There’s only a few twists in it so you don’t really have to think much in this movie, it’s mostly a “sit back, relax and enjoy some HD and surround sound action”-kinda movie. I’m rating this movie with 3 apples out of 5. One apple for John Travolta, one for managing to entertain me for the full 92 minutes and one for the action. Rent it if you can – don’t buy it. Rent From Paris With Love from our friends at LOVEFiLM today. Also sign up now and receive a 30 day free trial and countless more benefits and offers. I agree it’s a renter at best! Hey Klaus I really love this post, this really a great movie Paris With Love ,I saw that movie 3 times with my friends. John Travolta, he is my one of the best hollywood superstar actor,I saw his movie Face off , so many times and he such a brilliant actor. Thanks again for this post. Previous post: I got an iPad ! !